Yes…I added another challenge this week. And I am sure there are more to come. I’m probably like you, addicted to books, addicted to challenges, and addicted to the buttons. I try to rationalize each and every challenge I sign up for, because like my 5 shelf TBR book case, I don’t want it to get too out of control. So my thinking is that since I have a large book case filled with just TBR books, not counting what is being stored in Kimmy Kindle and Sophie Sony, it is because of all of my blogging buddies that I have met along the way. I have added so many books from recommendations, reviews I have read and/or through memes that I participate in like Mailbox Monday that this challenge, that this was a good challenge to sign up for. This makes #8 and there are still some that I am waiting and hoping for. What about you? 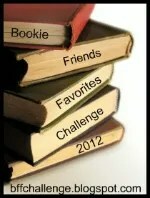 How are you doing with your 2012 Challenges? Added any more? Are you, like me, waiting for certain ones? Did you sign up for this one? Would love to hear!! 2. Click on the “Sign Up” tab above and leave the link to your challenge post, not to your blog’s home page. 3. Visit the other participants and choose books to read. You can choose them all at once or as you go. Add the title to your original post, making sure to link back to the person whose favorite it is. I can’t wait to see what your favorites are! !